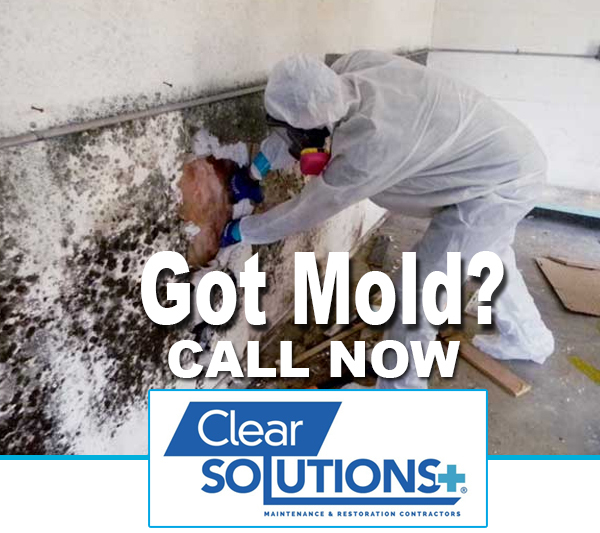 Clear Solutions Plus has certified and experienced mold remediation experts available to quickly evaluate, estimate, contain, and remediate mold, water damage, and hazardous elements that may appear in your home, or office building. It is essential to remember mold resulting from water damage or a lack of proper ventilation is progressive and must be addressed immediately. That is why "Timely" action must be taken by homeowners when water damage & mold growth occurs due to storm rain, plumbing leaks, and excessive moisture/humidity. The longer water flows or wet, damp or dark conditions exist, mold will colonize and absorb into building materials, resulting in a greater recovery problem. Merely stopping the source of the incoming water does not stop further water damage and often causes secondary damage. Contact us today for all your indoor air quality needs. "We are your solution to indoor air pollution"
For the certified and experienced mold remediation experts check Clear Solutions.